A well known eating apple with green skin and a sweet, honey flavoured flesh. Growing your own Golden Delicious apples will prove much tastier than shop bought! The shop bought Golden Delicious are picked early and stored, preventing their true flavour from developing. The developed flavour of Apple Golden Delicious is very sweet and rich, a real treat for the taste buds. 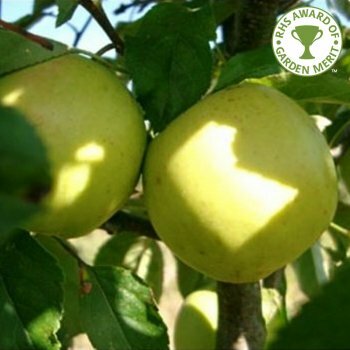 Apple Golden Delicious is from the USA in the 19th century and remains a popular choice for UK gardeners. It does require a good position and isn't suited to cooler climates. A pollination partner in group B or C situated within a half mile radius will ensure good crops in late October. Golden Delicious is a pollination group C apple tree and requires a pollination partner in group B or C within a half mile radius. Apple trees should be spaced according to their rootstock, for example an MM106 (semi-vigorous) rootstock will require approx. 4.5 metres between trees, whereas an M27 (very dwarf) rootstock will require approx. 1.5 metres between trees.